Keats and his friend Bailey visited The Birthplace and Holy Trinity Church in Stratford-upon-Avon. On 3 October 1817, they caught a coach to Stratford-upon-Avon, and visited Shakespeare’s birthplace (the house on Henley Street) and resting place (Holy Trinity Church), before returning to Oxford. 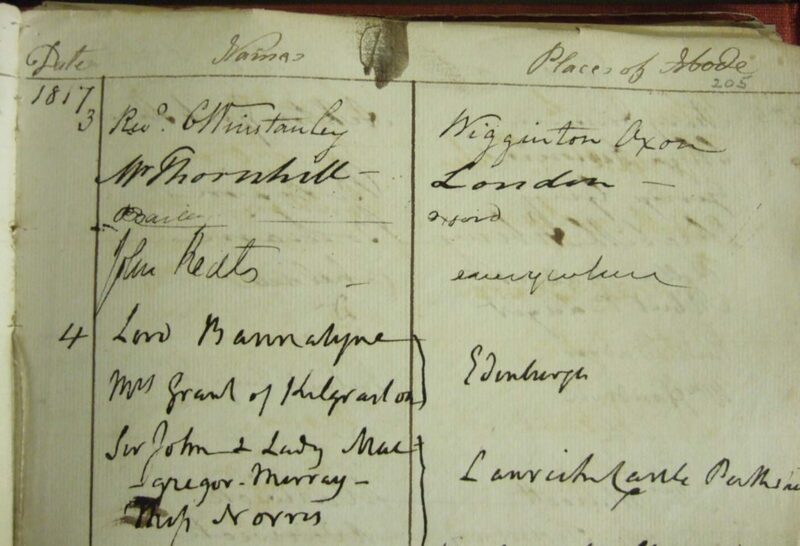 They signed the visitor books in both locations – though Bailey later indicates that they (also?) signed the bedroom wall in The Birthplace. If so, they were not the only ones! There was a grand tradition of signing either the walls or the panes of glass in the window. The much scratched window was eventually replaced, but is currently on display (protected behind glass!) in the house. Bailey’s and Keats’ signatures at The Birthplace. Bailey gives his ‘Place of Abode’ as ‘Oxford’, while Keats – mischievously? seriously? in a state of negative capability? – gives his as ‘everywhere’. Source of this image: bloggingshakespeare.com. 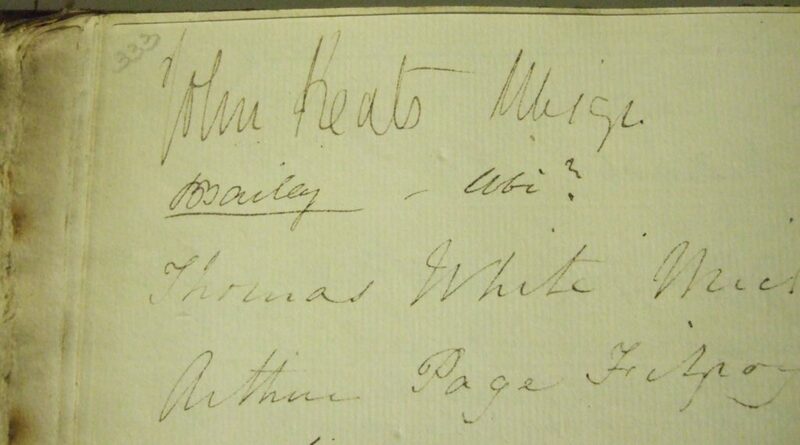 Keats’ and Bailey’s signatures at Holy Trinity Church. At the Holy Trinity Church, Keats provides the same place of abode – but in Latin this time: ‘Ubique’. Bailey then follows with ‘Ubi’, which I believe means ‘when, where’ in Latin – perhaps adding a question mark…? I am not learned in interpreting such things. But bless their hearts! We can easily follow Keats and Bailey on their pilgrimage. 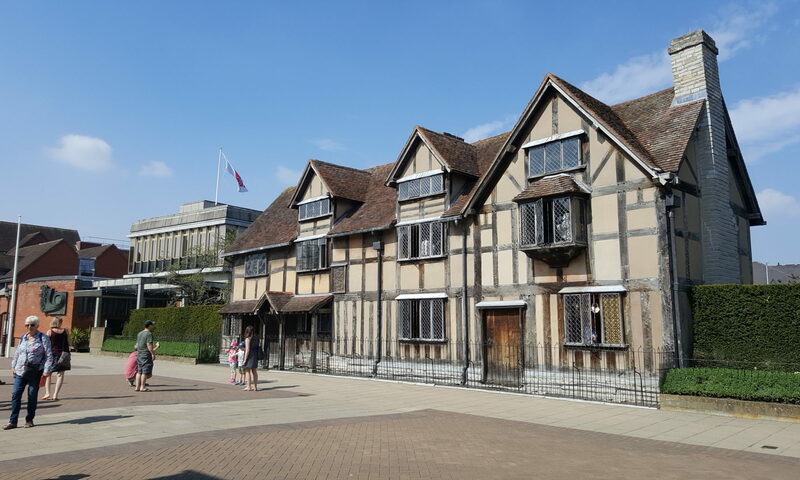 The Birthplace and other significant Shakespearean locations are managed by the Shakespeare Birthplace Trust and open to the public. The Holy Trinity Church is also open to the public, except on Sunday mornings and during any other services. I assume, if you have the chutzpah or scholarly credentials, you could also ask to see the original visitors books in the archives. 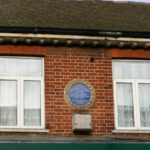 The site of Thomas Hammond’s house and surgery, marked by a blue plaque. The garden at the corner of Church Street and Winchester Road. 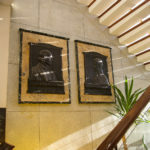 Community House, the new location of George Frampton’s bronze reliefs. 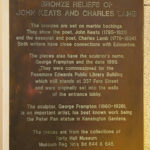 George Frampton’s bronze reliefs of John Keats and Charles Lamb. 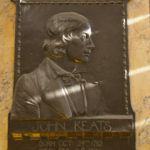 George Frampton’s bronze relief of John Keats. 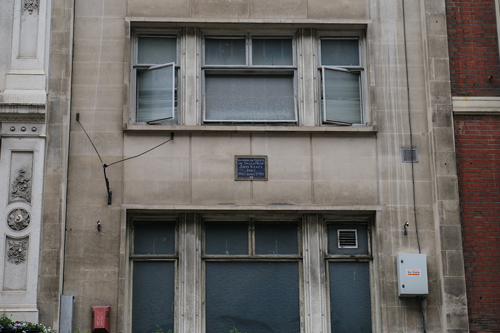 The original location of George Frampton’s bronze reliefs; formerly a library and now a mosque. John Keats and his siblings lived with their grandmother on Church Street in Edmonton, and Keats later worked as an apprentice at Thomas Hammond’s surgery on Church Street. Keats’ grandmother Alice Jennings had moved from Ponders End to Church Street in Edmonton after his grandfather John Jennings died in early 1805. When Keats’ mother Frances Rawlings (widowed and re-married) abandoned her four children, they went to live with the 69-year-old Alice. John Keats was nine years old at the time. I haven’t found a street number or any other details of Alice’s house. Edmonton at that time was a village with a population of about 5,000, surrounded by countryside and separate from London. It was praised in a local history of 1819 as having “many advantages … the beauty of the scenery, the variety of the views, and its vicinity to the metropolis, would not be overlooked by those whose rank and fortune enabled them to select a suitable residence”. John Keats and his brothers attended school as boarders in the village of Enfield, which was two miles from Edmonton. In early 1809, Keats’ mother Frances Rawlings returned to live with Alice and the children in the Church Street house. She was seriously ill, however, and died in March 1810. Despite his comparative youth, Keats nursed her devotedly throughout his school holidays. In autumn 1810, when Keats was almost fifteen, he left school and began training as a surgeon-apothecary. He was taken on as an apprentice by Thomas Hammond, a neighbour in Church Street and the doctor who had attended both John Jennings and Frances Rawlings in their final illnesses. The apprenticeship included board and lodging, and Keats took his meals in the main house. The surgery was based in a cottage behind the house, though, and Keats slept in the cottage’s attic. Keats’ grandmother Alice died in December 1814. By this time, his three younger siblings were all based in London (George and Tom at work, and Fanny at school), so Keats no longer had any family near him. His apprenticeship with Hammond was completed in mid 1815, and from October 1815 Keats was training at Guy’s Hospital in London. The siblings and co-authors Charles (1775-1834) and Mary (1764-1847) Lamb also lived in Church Street, from 1833, in a house known at the time as Bay Cottage – and Charles died there in 1834. This is a private property, but there is an Edmonton Heritage Trail green plaque at the gate, and an English Heritage blue plaque on the house itself. The siblings are buried together at All Saints’ Churchyard, just across the road. Thomas Hammond’s house and cottage at what was 7 Church Street were demolished in the early 1930s. 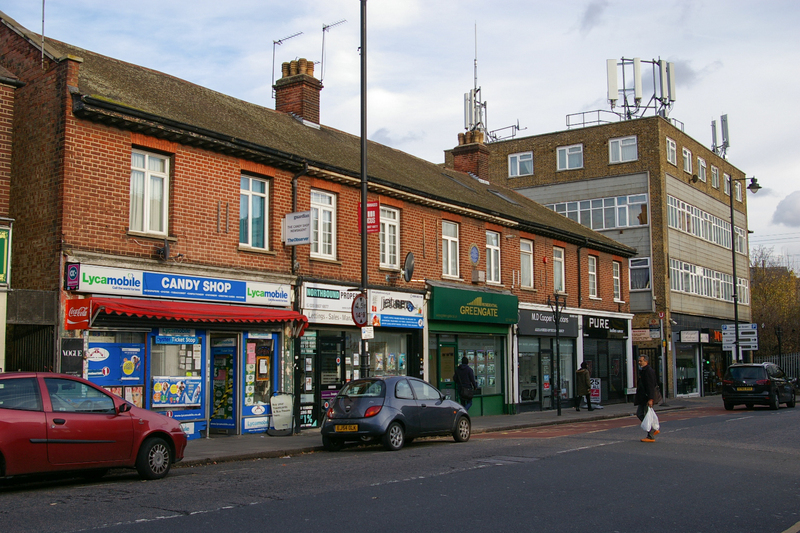 The current buildings date back to that time, and feature a series of shopfronts at street level. 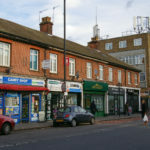 The location is now known as “Keats Parade” in honour of the poet. 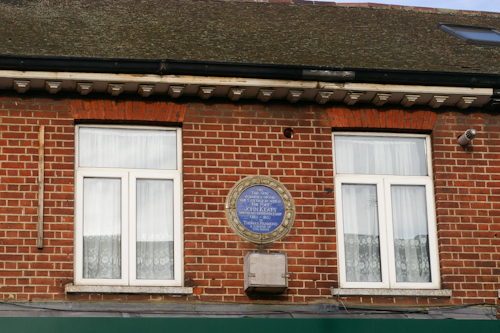 A plaque is placed at the centre of Keats Parade, above what is currently a real estate agency. It’s difficult to get a good photo, as there’s a ramshackle wooden box on the wall just below it! 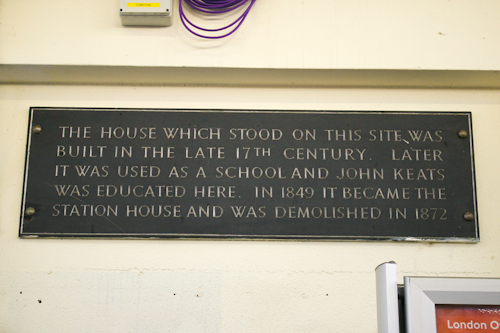 The earlier date is slightly incorrect, in that Keats’ apprenticeship began in autumn 1810. Opening hours: The blue plaque can be seen at any time. 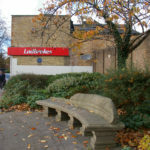 Further along Church Street, on a corner where it meets Winchester Road, there is a small garden with a stone bench featuring a quill as its backrest. 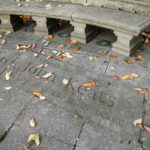 The paving at the bench’s foot is carved to commemorate the (male) literary connections of the area, Charles Lamb and John Keats. 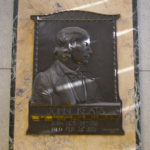 A pair of bronze reliefs also commemorate Charles Lamb and John Keats. 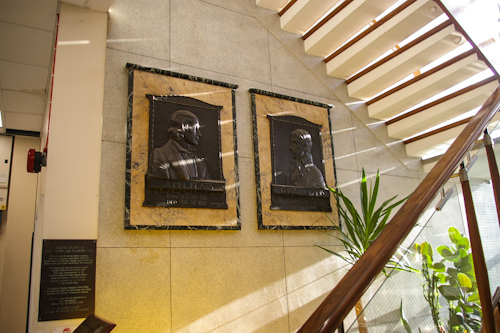 These were created by sculptor George Frampton in 1898, and were originally displayed in the lobby of the Passmore Edwards Public Library Building on Fore Street. 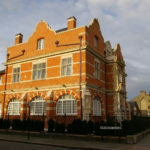 The library building is now a mosque, however, and the bronze reliefs can instead be found at Community House, 311 Fore Street, Edmonton, London N9 0PZ. 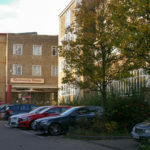 Please note that this community centre is used by a wide range of people, some of them vulnerable, and anyone visiting should treat the staff and other visitors with respect. Also note that you will be required to sign in at the security desk. Once in, follow the signs to the cafe (which serves darned good cake). 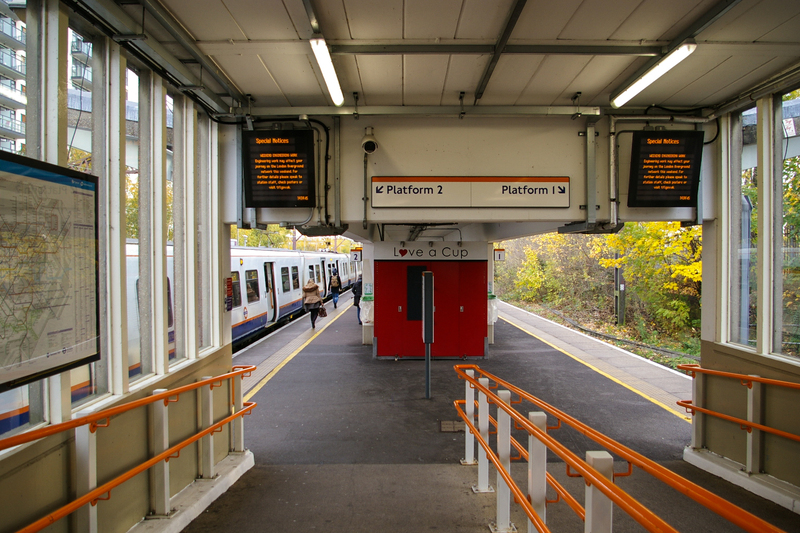 Just before you get there you’ll find a junction of hallways, lifts and stairs. The bronze reliefs are on the wall under the staircase to the right. The church of St Stephen Coleman Street is where John Keats’ parents and maternal grandparents, and his younger brother Tom, were buried. There is now nothing left but a blue plaque. It makes for sad reading! Keats lost all his most significant figures from the previous generations in the space of just over ten years, beginning with his father when John Keats was only nine years old. However, St Stephen’s was also associated with a few more positive occasions. His grandfather John Jennings was baptised here on 13 October 1730. His maternal grandparents John Jennings (age 43 years) and Alice Whalley (age 38 years) married here on 25 February 1774. His father Thomas Keats died on 15 April 1804, and was buried at St Stephen’s on 23 April 1804. His grandfather John Jennings died less than a year later on 8 March 1805, and was buried at St Stephen’s on 14 March 1805. His mother Frances Jennings Keats Rawlings died five years later, and was buried here on 20 March 1810. His grandmother Alice Whalley Jennings died four years later, and was buried here on 19 December 1814. Finally, his brother Thomas Keats died, and was buried here four years later on 7 December 1818. The burials were all in the Jennings family vault. The church itself was destroyed in 1940. I know it sounds a little ghoulish, but I have asked a librarian friend if we can find out what happened to the bodies… I would like to pay my respects. St Stephen’s was first mentioned in the 13th century. It became a “Puritan stronghold” for a while in the 17th century. The playwright and contemporary of Shakespeare, Anthony Munday, was buried there in 1633. The medieval church was destroyed in the Great Fire in 1666. It was re-built by Christopher Wren, with the exterior completed by 1677. Further work on a gallery and burial vault was done in the 1690s. This is the church that the Keats family would have known. The church was destroyed by incendiary bombing on 29 December 1940, and it was not re-built. 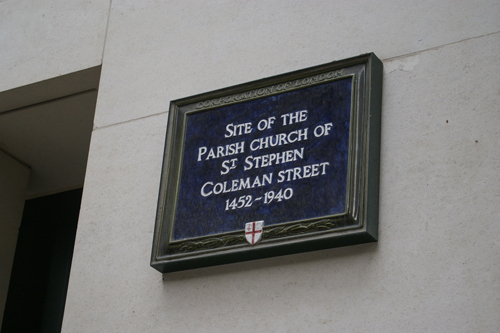 The parish was combined with that of nearby St Margaret Lothbury – which for various reasons accumulated a number of City parishes, and is now officially known as “St Margaret Lothbury and St Stephen Coleman St with St Christopher-le-Stocks, St Bartholomew-by-the-Exchange, St Olave Old Jewry, St Martin Pomeroy, St Mildred Poultry and St Mary Colechurch”. 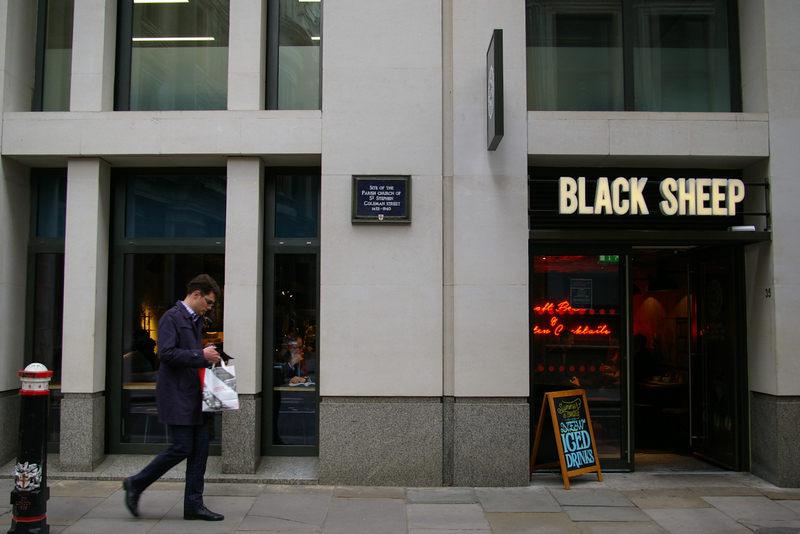 You can find it nearly opposite the junction of Coleman Street with King’s Arms Yard, outside Black Sheep Coffee. 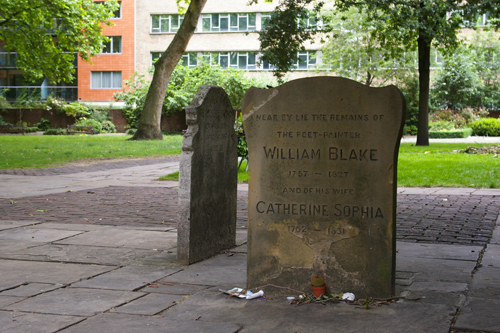 The Bunhill Fields Burial Ground has two sad connections with Keats. His youngest brother Edward was buried there, having died while still a baby. A little more than a year later, his father Thomas was fatally injured in a riding accident near the cemetery gates. A general shot of the burial ground. Edward was the fourth child of Thomas and Frances Keats, born on 28 April 1801. Unfortunately he died at the age of 20 months. I have never seen any details about a cause of death, but I suppose in a time of somewhat higher infant mortality, such things were lamentably not very unusual. Edward was buried on 9 December 1802 in Bunhill Fields. Relatives of Keats’ maternal grandfather John Jennings had already been buried there, and it is also very near to where the Keats family were living in Craven Street, so it seems a clear choice of graveyard. The burial register lists Edward as “brought from Craven Street City Road”, and buried in a common grave, at a cost of seven shillings and sixpence. It gives the location of the grave as 44 on the east-west axis, and 35 on the north-south axis. I’ll have to work out if I can visit to pay my respects (many of the graves are fenced off and inaccessible without a guide). I assume there’s no individual marker. The Keats family moved back to the Swan and Hoop in Moorgate in 1802, when Thomas took over the management of the stables and inn on the retirement of John Jennings. In the early hours of 15 April 1804, Thomas was riding home (south) along City Road when he fell or was thrown from his horse. We are not sure of the details, as it seems there were no witnesses to the accident. A nightwatchman saw his riderless horse heading for home, and found Thomas lying unconscious outside the gates to Bunhill Fields. Thomas was taken to a nearby surgeon, but his injuries were beyond help. He was then taken home to the Swan and Hoop, where he died that morning, at the age of 31 years. 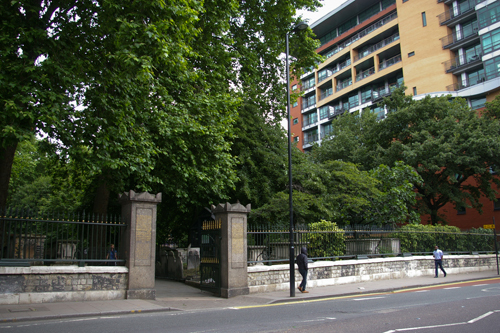 The Bunhill Fields gates on City Road. The name “Bunhill Fields” probably derives from “Bone Hill”. This dates back to 1549, when over a thousand cartloads of human bones were brought from St Paul’s (soon to be demolished) charnel house. The remains were spread over the moor and covered in soil, creating a flat ‘hill’ in the otherwise marshy landscape. In 1665, Bunhill Fields was enclosed with walls to be used as a burial ground. The Church of England never consecrated the ground, however, and it was open for the interment of anyone who could afford the fees – so it became popular with Nonconformists. The most well-known people buried here are John Bunyan, Daniel Defoe, and Romantic poet William Blake. The headstone for William and Catherine Blake, which has been moved from where they are buried. 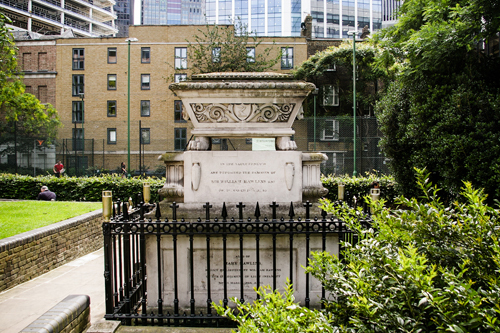 Bunhill Fields is situated between Quaker Gardens on the west – the remnants of a Quaker burial field used from 1661 to 1855 – and Wesley’s Chapel across City Road to the east – a chapel built by John Wesley in 1778, which you can visit along with his house and his tomb. 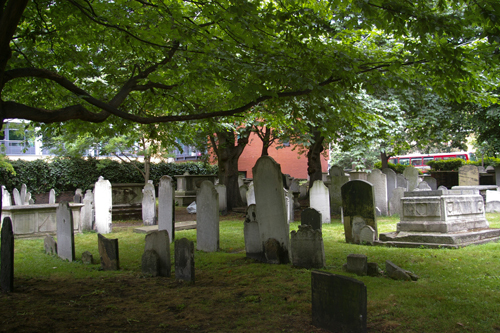 Once Bunhill Fields became full – after approximately 123,000 burials over the years – the burial ground was closed to further interments from 1853. The Corporation of London took on responsibility for running the ground in 1867. They began the process of turning the burial ground into a park – with new walls, gates and paths. It was opened to the public in 1869. There was damage caused by bombing during the Second World War, and Vera Brittain also described Bunhill Fields as being the location of an anti-aircraft gun. 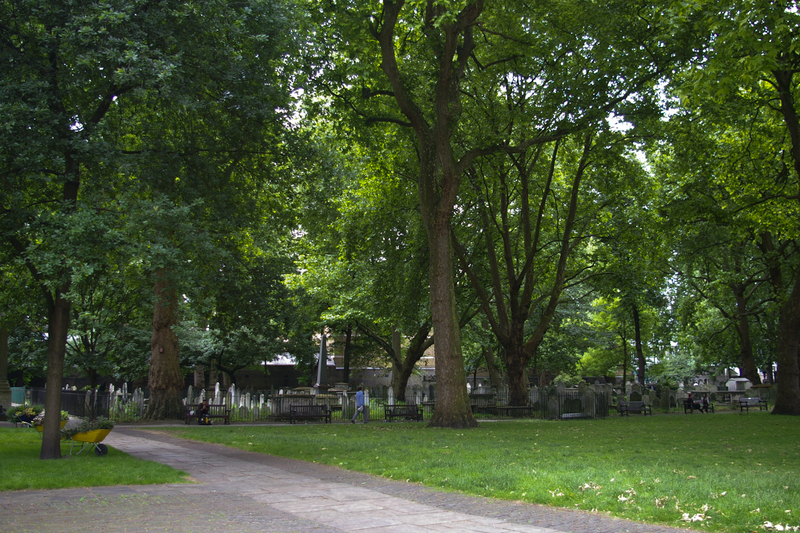 In 1949, following the war, landscape architect Sir Peter Shepheard was engaged to develop Bunhill Fields. His plans were finally implemented in 1964-65. Much of the original graveyard in the southern section was maintained, though fenced off. The more damaged northern section was cleared and turned into a community garden. 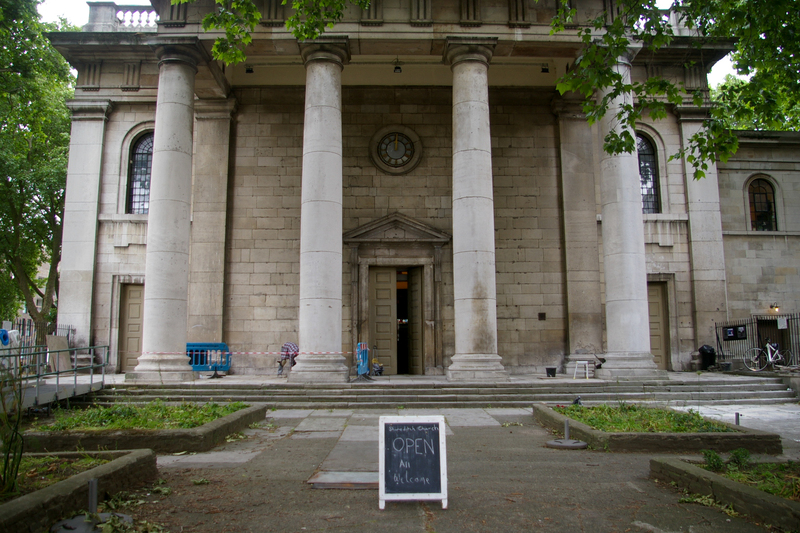 St Leonard’s Church in Shoreditch is where John Keats’ three younger brothers were baptised – all on the same day! It is assumed that Keats was born at the Swan and Hoop in Moorgate, and he was certainly baptised at the nearby St Botolph’s in 1795. 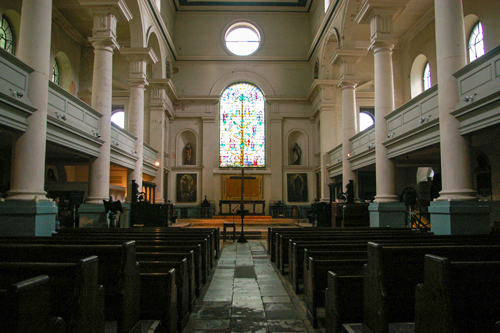 All three boys were baptised on the same day, 24 September 1801, at St Leonard’s in Shoreditch. Unfortunately, Edward did not survive childhood, and died in 1802, aged only 20 months. Rather more happily, a daughter Fanny was born in 1803, after the family had moved back to Moorgate. There’s always so much history associated with these City locations! 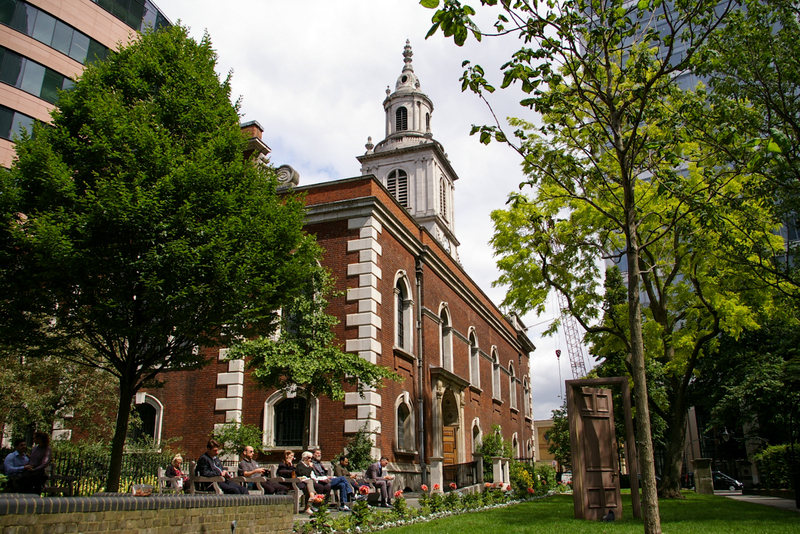 St Leonard’s, also known simply as Shoreditch Church, stands where all the Roman roads joined up, including roads from Chester, Bath, Lincoln, York and Colchester. (All roads lead to London, in this case!) The Wallbrook river rose at the site, making fresh water available, though I assume it’s all underground now. There was an Anglo-Saxon church, which was replaced by a Norman church, with mention of its first vicar in 1185. This Norman building became “the actors’ church”, as it was sited near New Inn Yard, the Theatre, and the Curtain. James, Cuthbert and Richard Burbage were buried in the church, as well as Richard Tarlton and Gabriel Spenser! Given the nearby river and the high water table, the church was fated not to last. When it collapsed, the current building was constructed on top of it – and the old church that would have been known by Shakespeare became the crypt of the new one. The current church dates to 1740, and was designed by George Dance the Elder. Its light and airy style was very innovative at the time, and initially wasn’t received well. 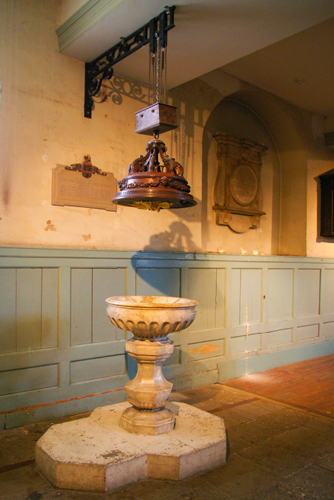 The Church’s Wikipedia page states that the font is one of the original 18th century fixtures – and, if so, that means it’s the actual font in which the three younger Keats brothers were baptised. The font, which I assume is the one used in baptising the Keats boys. The Church is well worth a visit, though I suppose there’s no denying it has a fairly shabby, lived-in feel to it. That’s kind of refreshing, now I think about it! While pretty much everything but the ceiling needs a fresh lick of paint, the overall light colour scheme with a teal accent is just delightful. 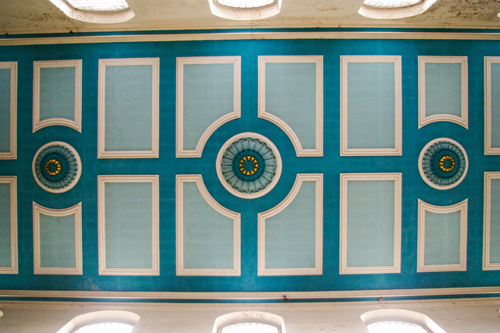 The least shabby part of the church is the gorgeous ceiling! 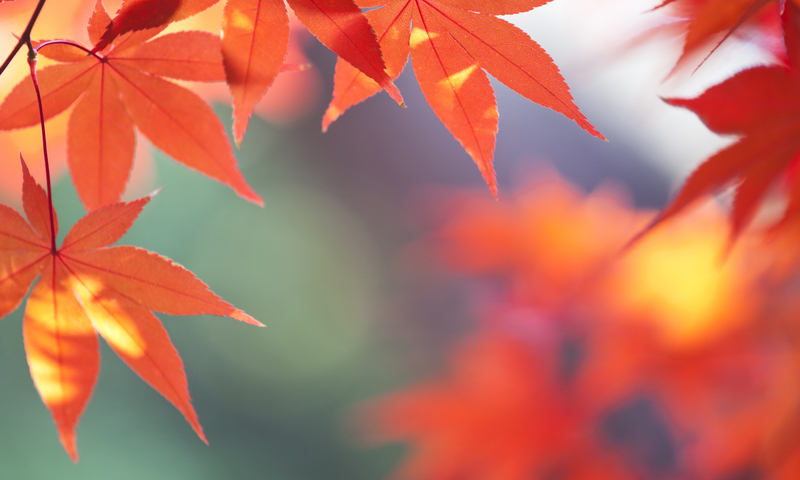 Opening hours: Monday to Friday from 12 noon to 2pm, and for a service on Sunday. Given the restricted hours, it’s best to check ahead, if possible! Tours are available of the crypt and the tower, but only by appointment. 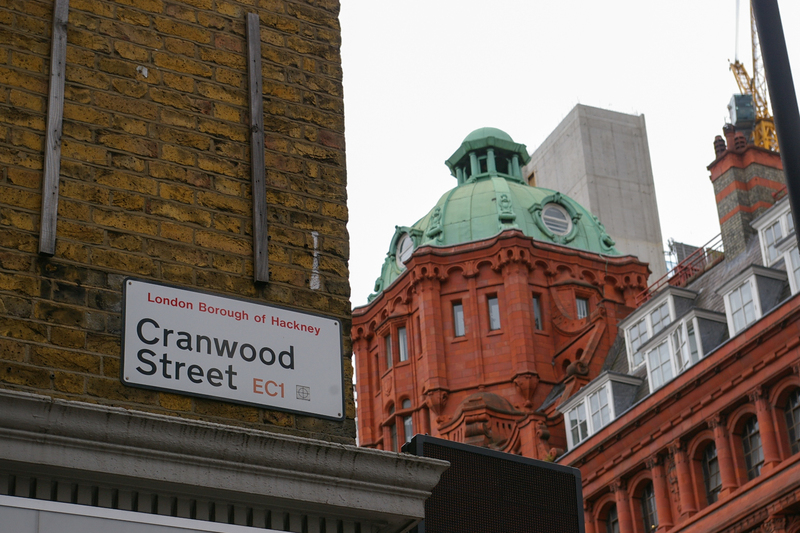 The Keats family lived at 12 Craven Street (now Cranwood Street), off City Road in Shoreditch, when Keats was a child. There is now nothing to see but modern offices and apartment buildings. 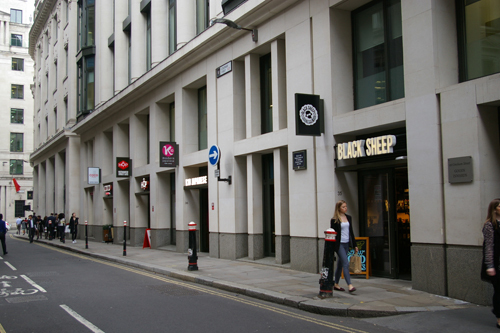 Keats’ parents, Thomas and Frances Keats, lived at the Swan and Hoop Livery Stables in Moorgate when they were first married, and it is assumed that’s where Keats was born in 1795. By 1797, however, the young family were living in their own home at 12 Craven Street in Shoreditch, while Thomas rode (or walked) to work at the Swan and Hoop each day. Keats’ three younger brothers were born in Shoreditch, and the youngest, Edward, died there while still a child. In Keats’ time Craven Street was on the outskirts of London, and there were fields immediately to the north. A map of 1799 shows “Mr Champion’s Vinegar Manufactory” just to the south of the Craven Street houses. After about five years, in 1802, the Keats family returned to live at the Swan and Hoop, to take over the business from maternal grandparents John and Alice Jennings on their retirement. I haven’t found any specific dates on the handover of the business or the family move. However, the Bunhill Fields burial register records that Edward was “brought from Craven Street City Road” for burial on 9 December 1802. I am not sure of the history of this street. Today, there is nothing left that Keats would recognise. The ‘odd’ side of the street is now all modern office buildings, and the ‘even’ side is residential – but the apartment buildings date to after his time. Also, the map of 1799 indicates a row of terrace houses in Keats’ time, while the current apartments are split up into various blocks – so there is no longer a “Number 12” to find. There isn’t even a plaque to see. This is one for the completists! 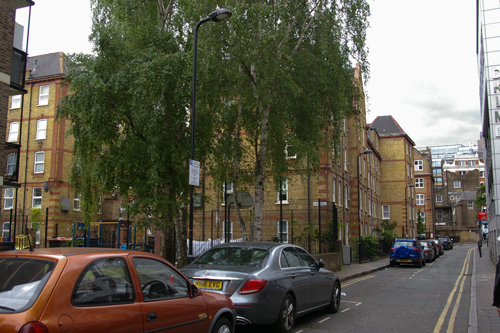 Standing on the north, ‘odd’ side of the street, looking along it towards the south-west. Opening hours: Not open to the public. The Swan and Hoop Livery Stables, just north of the old London Wall, is assumed to be where John Keats was born in 1795. 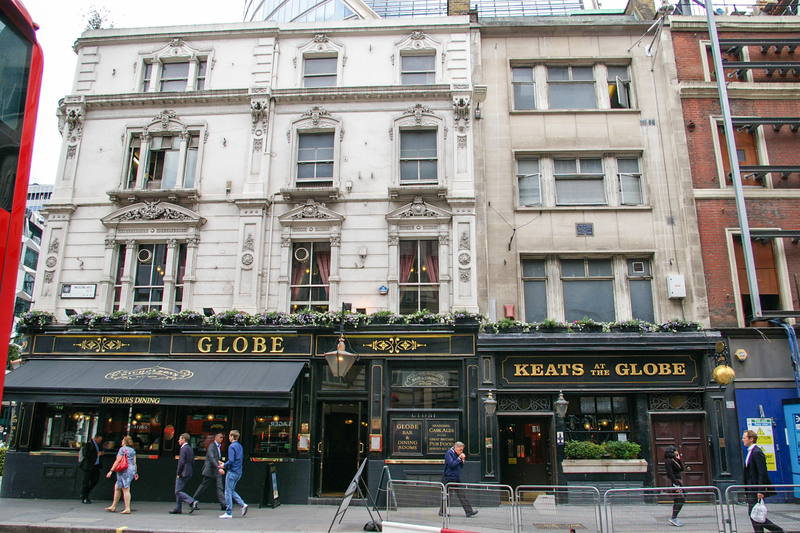 The buildings of Keats’ time were demolished some while ago, and the current building now houses the Keats at the Globe bar. 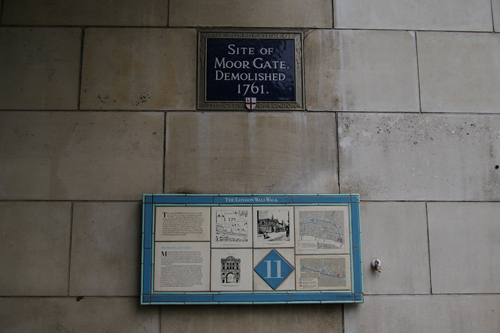 A plaque marks where Moorgate once stood as part of the London Wall, very near the Swan and Hoop. John Keats’ maternal grandfather, John Jennings, with new wife Alice Whalley, leased the Swan and Hoop livery stables from February 1774, and later also rented the inn beside the stables. The establishment was located just north of where Moorgate (the gate) allowed entry through the London Wall. 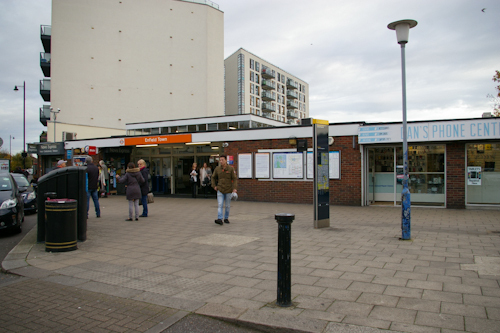 Jennings was therefore ideally placed to cater for travellers journeying in and out of London along (what is now) City Road. Jennings employed Thomas Keats at the Swan and Hoop – we think as an ostler, though as Thomas was able to keep his own ‘remarkably fine’ horse, his origins may have been rather less humble than that implies. In any case, Thomas married John and Alice’s daughter, Frances Jennings, in 1794, and the young couple lived either at the Swan and Hoop or nearby. 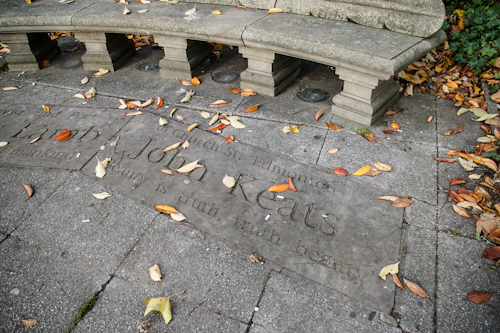 John Keats was born to Thomas and Frances on 31 October 1795. 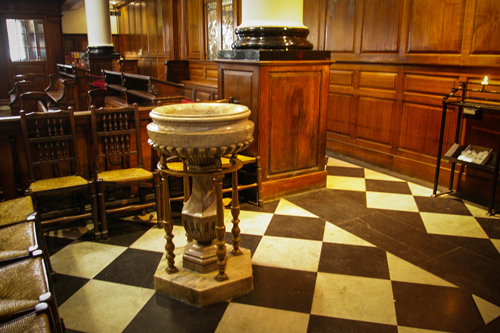 John was baptised at nearby St Botolph’s, so we assume he was born at the Swan and Hoop. Hence, the Swan and Hoop is where The Birthplace plaque is, but there is no definite proof one way or the other. When John’s brother George was born in February 1797, we know that the family were living in Craven Street, Shoreditch (and George was baptised at nearby St Leonard’s), but we are not sure when exactly the family moved. The youngest child, Frances Mary (Fanny), was presumably also born at the Swan and Hoop, on 3 June 1803. When the London or City Wall was first built in Roman times, it blocked the course of the Walbrook stream, and this created a marsh or ‘moor’ along the north of the wall. Later, in the Middle Ages, when a small gate was built in the wall, it was named Moorgate after this ‘natural’ feature. The marsh was slowly drained during the 1500s, and was eventually laid out as a formal park, known as Moorfields. In 1672, Moorgate (the gate) was rebuilt as something more imposing – but in 1761, this was demolished to allow more traffic through. In 1675-76, a new hospital was built along the London Wall running to the east of Moorgate, to accommodate the Bethlem Royal Hospital, infamously known as ‘Bedlam’. By 1791, this huge building was in very poor condition, and parts of it were uninhabitable. It continued to be used, however, until a new building was finally available in Southwark in 1815. Following this, the London Wall along that area was demolished in 1817. As a child, then, Keats would not have known Moorgate as a ‘constructed’ gate, although much of the nearby London Wall was preserved. He would have known Moorfields as open parkland. And he lived literally just over the road from a deteriorating Bedlam! Looking north up Moorgate (the road), with the Swan and Hoop’s location ahead to the left (now The Globe). 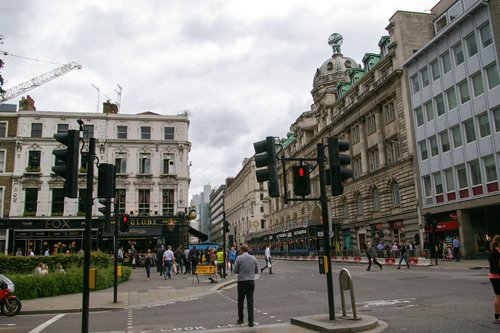 Moorgate (the gate) would have been roughly where the three pedestrians are crossing (left to right). 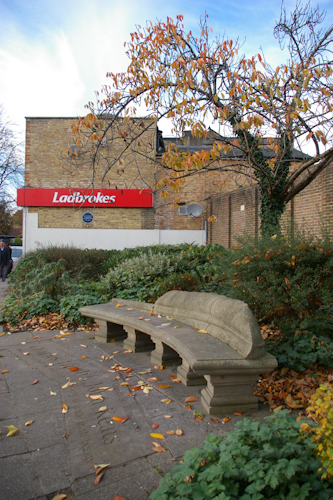 The gate’s blue plaque is within the open ground-floor area of the building to the far right. I confess myself a tad confused over whether Keats would have known the road at the front of the Swan and Hoop as ‘Moorfields’ or ‘Little Moorfields’. Today, however, the thoroughfare is known as Moorgate. To the north, once it passes Ropemaker Street and South Place, the road becomes Finsbury Pavement. I am not sure of the history of the current buildings at the Swan and Hoop’s location, but they certainly contain nothing that Keats would have recognised. I’ll take my telephoto lens next time! In his biography Keats (1998), Andrew Motion says the frontage of the livery stables was ‘117 feet long’ (page 6). This indicates that the Swan and Hoop ran a fair distance up along what is now Moorgate, so I’m not sure if there’s a reason why 85 Moorgate is the claimant of the blue plaque. By the way – just as ‘Moorgate’ has nothing to do with Othello, ‘The Globe’ has nothing to do with Shakespeare. ‘The Globe’ has been a popular pub name since the reign of Charles I. The symbol of the globe (i.e. the world) was associated with Portugal, and the pub name therefore signified that it served ‘fine Portuguese wines’. Opening hours: The blue plaque can be seen at any time, though it’s fairly small and quite high up, so you may want to save it for daylight hours! The pub is open every day except Sundays. Check the official website for more details.